This groundbreaking project is the first of it’s kind – jazz genius Roy Ayers performing with a Hip Hop/DJ legend PETE ROCK – in a Live band/DJ / Mc format. The show will feature exciting rendition’s of Roy’s most celebrated hits – Everybody Loves the Sunshine, We live in Brooklyn, and many others – with Pete Rock sampling Roy’s music and adding more hip hop flavor with his beats and rhymes. This is truly a meeting of minds, a show not to be missed, as it is history in the making and re-making in front of your eyes. Droppin’ Science is back this February at the Vibe Bar with yet another big night in store. Last month resident DJs Matman, Nickname and Daredevil ripped the place apart, blazing through fast-paced sets of hip hop & it’s related genres. In February you can expect all this and more as we will be joined by our very special guest, Paul White (One-Handed Music / Now-Again). Paul White’s production has been generating a lot of noise in recent years, & won himself a lot of high-ranking fans, gaining airplay & support from the likes of Diplo, Mary Anne Hobbs, Benji B and Gilles Peterson. After releasing the acclaimed LPs ‘The Strange Dreams of Paul White’ & ‘Sounds From The Skylight beat tape’ in 2009, 2010′s ‘Paul White & The Purple Brain’ was co-released by both One-Handed and Los Angeles-based Now Again, sister label of the mighty Stones Throw Records. Don’t sleep on East London’s liveliest Hip Hop party, every first Saturday of the month at Vibe Bar! 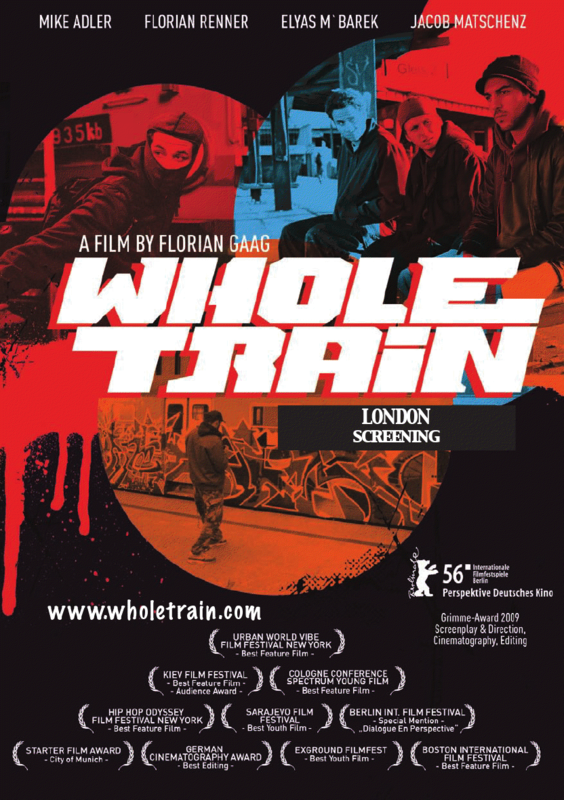 Trackside Burners (DJ pHiLLy) present the London screening of critcal acclaimed award winning underground graffiti film “WHOLETRAIN” – brought to you with Count on Earl (Trojan Soundsystem) featuring live music from PROSE & The Estimators. 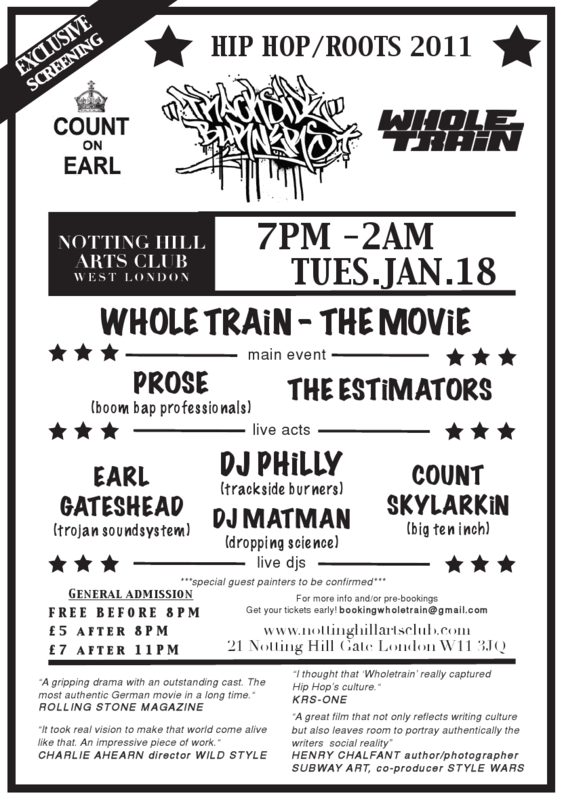 Also on the two turntables DJ Matman, Count SkyLarkin, Earl Gateshead and DJ pHiLLy. Expect reggae, soul, funk, hip hop from the underground….overground for you….exclusive painting by OTP crew and special guests. From the old to new. Pete Rocks production acumen was highly praised along side of his partner in rhyme [C.L. Smooth] who possessed a distinctive flow matched with a perfect delivery. Classical songs such as They Reminisce Over You (T.R.O.Y. ), a tribute song packed with emotions that hasnt been duplicated up to this day and showed the conscientious of the lyrical rhyme slayer C.L. Smooth. After successfully releasing three albums the soul-tight brothers departed ways leaving die-hard fans in a frenzy for the signature horn loops of Pete and the verbal play of the smooth one. Droppin’ Science is back again on November 6 with yet another heavyweight line-up including extra special guest, and extended family member DJ MR THING. Doubling up as a birthday bash for Nick, expect a couple of extra guests warming up the floor alongside residents Nickname, Matman & Daredevil. This man needs no introduction… he’s guaranteed to completely smash it in a way that only he can with his profound ability to select the perfect party bangers. Don’t miss out on what is set to be yet another legendary night out! > Reppin’ North London will be HIGH FOCUS RECORDS & JAM BAXTER delivering the ‘RINSE OUT FRIDAY / SPACK OUT MONDAY’ album to ya. A sick album that finds Baxter in full flow over some a-grade beats. He’s most certainly up there with the best right now. Watch for special guest appearances on stage too, don’t sleep, this’ll be large. All taking place @ Vibe Live (upstairs @ Vibe Bar), Brick Lane, London, E1. http://www.vibe-bar.co.uk – Kicking off at 8pm, £4 entry, however you can gain access to the bar below Vibe Live for free, before 8pm. Fresh after ramming out the vibe bar at the Brick Lane Festival, Droppin’ Science returns once again with yet another heavyweight special guest: Dj Swerve. Swerve holds a regular radio show on Kiss FM, weeknights Monday to Thursday 10pm til Midnight, spinning the best in Hip Hop, RnB & club bangers and featuring interviews with A-list artists from all over the globe. His show recently scooped the 2010 Urban Music Award for best r…adio show, following last years UMA win for best dj! Swerve’s production skills have also been getting a lot of attention recently, as the man behind the massive ‘Street Fighter Riddim’ by D Double E, ‘Around My Way’ by Mystro, & many more – not to mention his highly succesful & well-crafted ‘Pure Hip-Hop’ & ‘Urban Kiss’ mix-cds. Swerve will be joined by Droppin’ Science residents Daredevil (DMC Champ), Nickname (55DSL) & Matman (DMC Champ).